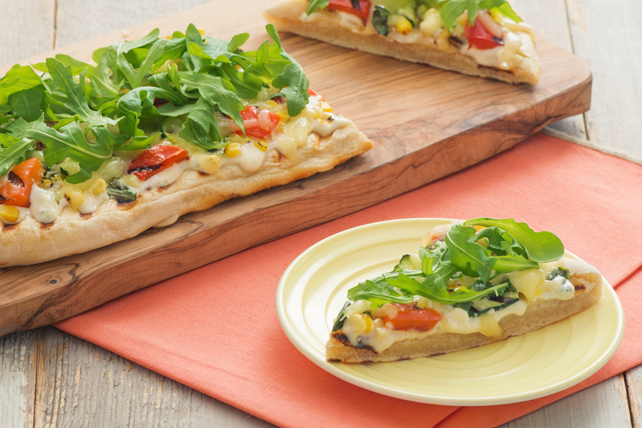 Topped with blue cheese dressing, mozzarella, Parmesan, grilled vegetables and arugula, this pizza is packed with great flavours. Mix garlic, black pepper and 2 Tbsp. oil until blended. Grill corn, zucchini and red peppers 8 to 10 min. or until crisp-tender, turning and brushing occasionally with garlic mixture. Meanwhile, cut pizza dough in half. Roll out each half on lightly floured surface to 10x5-inch rectangle. Brush evenly with half the remaining oil. Remove vegetables from barbecue; set aside. Place dough rectangles, oil sides down, on barbecue grate; grill 5 to 7 min. or until bubbles start to form on tops and bottoms are grill marked. Turn; brush with remaining oil. Grill 2 to 3 min. or until bottoms are lightly browned. Transfer to large baking sheet. Cut kernels off corn cob; discard cob. Cut zucchini and peppers into bite-size pieces. Reduce barbecue to medium-low heat. Spread dressing onto pizza crusts; top with cheeses, vegetables and basil. Return pizzas (on baking sheet) to barbecue. Grill 3 to 5 min. or until pizzas are heated through and cheese is melted. Top with arugula.